This blog post originally appeared on rootmetrics.com. If you haven't heard the term VoLTE bandied about, you probably will in short order. VoLTE is the next big advancement in mobile calling. Operators have been working for years to assure a smooth transition to VoLTE and the technology is already the default calling option for millions of consumers. Read on to learn more about how the technology works, what it promises, and what challenges must still be solved. 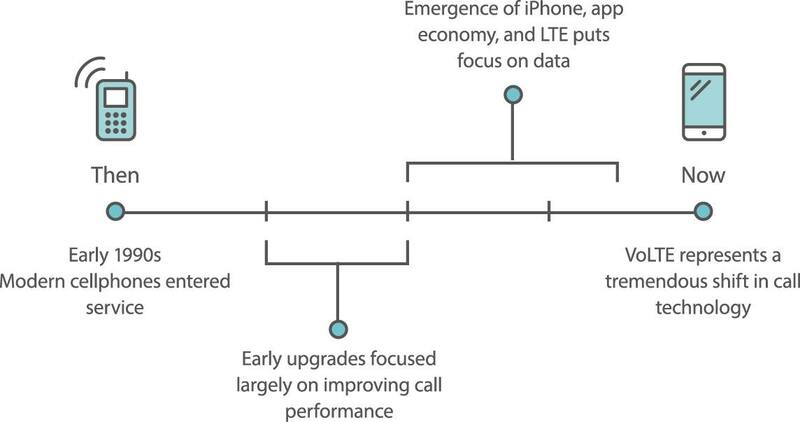 Let's start with LTE, which stands for Long Term Evolution and is the new standard for data delivery. The carriers love touting their LTE coverage, and for good reason: LTE delivers faster and more reliable data service, making it easier to use your mobile device for surfing the web, sending emails, streaming music or video, and countless other data tasks. Ok, but what does data service have to do with making a call? Good question. VoLTE adds voice calling to LTE networks and stands for Voice over LTE. To put it simply, with VoLTE, your call will be traveling on the carrier's LTE network rather than a traditional, circuit-switched call path. VoLTE represents the next phase of evolution for mobile calling and cell networks. What's the big deal and why should I care? VoLTE can support the AMR-WB (Adaptive Multi-Rate Wideband) codec. A codec is a means for compressing and decompressing large files (get it: codec =compressing/decompressing). The AMR-WB codec increases the audio samples used per second to deliver less background noise and crisper, more nuanced audio quality. One caveat: VoLTE can also be used independently of the AMR-WB codec. A VoLTE call is not always an HD Voice call, and vice-versa. That said, VoLTE will bring the possibility of HD Voice to millions of consumers. Because calls will take place on the same network used for data, you can generally expect a quicker set-up time and faster call connection. The positive: no more empty space while you wait for your call to start. The negative: less time to rehearse what you want to say while waiting for your call to start. Even better, after your call is established, VoLTE promises lower latency (the time delay between when a speaker utters a word and when the listener actually hears it). VoLTE should lessen that awkward lag between speaking and hearing that sometimes occurs on calls. As with any new technology, there will undoubtedly be some hiccups during the transition period. Long-term, however, you can expect fewer call failures with VoLTE because there will no longer be a need to switch between data and call networks. The benefits of VoLTE "sound" great! But how exactly does a VoLTE call work? We've already established that a VoLTE call takes place on the carrier's data network. To understand how this works, it's helpful to first compare "circuit-switched" delivery and packet delivery. If you're not on VoLTE, your call is made using circuit-switched delivery. A circuit-switched call needs a dedicated pathway (or circuit) between the caller and receiver. This point-to-point connection stays open for the entire duration of the call and no one else can use it. Mobile calls have traditionally depended on circuit-switched connections. For carriers, using circuit-switched delivery means that they have had to devote valuable spectrum to maintain a separate call network. Under this system, data delivery takes place on one pathway, while calls are placed on another, isolated pathway. Unlike circuit-switched delivery, packet delivery breaks data into small blocks (or packets) that are delivered separately and then reassembled in the correct order after being received. Similar to VOIP applications like Skype and other Over-the-Top (OTT) services, VoLTE does away with circuit-switched dependencies and transmits calls via IP technology. QoS prioritizes certain streams of data (like VoLTE) for delivery using more stringent quality controls. Unlike other OTT data, VoLTE calls are assured special delivery parameters that maintain high call quality no matter what else is going or what other traffic the data network might be experiencing. As an analogy, think of QoS like an HOV lane on a busy highway: VoLTE call are routed onto a special delivery path (also known as a "dedicated bearer") and travel unimpeded compared to other data. OTT applications don't receive this same QoS control. Instead, OTT calls are carried in the LTE network with all other data and are given "best effort" for delivery. As a result, when congestion in the data network occurs, VoLTE calls will likely continue to move smoothly but OTT calls might struggle. Without question, VoLTE is the future of mobile calling. There are, however, challenges to overcome during this transition period. From a consumer standpoint, we now expect to be able to make a call to anyone no matter what carrier they have. From a technical standpoint, this type of interoperability is much more more complicated. VoLTE calls currently work only within the same carrier network. AT&T and Verizon have pledged VoLTE interoperability but the ability to call another network over VoLTE is not yet ubiquitous. As IHS Markit analyst Stephane Teral points out, there are two primary VoLTE roaming options: LBO (Ravel) or S8HR (S8 Home Routed). The GSMA, Teral notes, has approved S8HR and this decision could clear the way for early adopters to move forward. For more details, see the full IHS Markit report on VoLTE growth. VoLTE calls travel on a carrier's LTE network. Without any type of backup plan, a VoLTE call will fail if the carrier's LTE network becomes unavailable. Carriers are working hard to make sure that this doesn't happen. One potential solution is called SRVCC (Single Radio Voice Call Continuity). SRVCC transfers your call back to a circuit-switched network when LTE coverage drops, but this system is tricky and doesn't always work. Another solution? Guarantee 100% LTE coverage. As each carrier's LTE network footprint nears 100%, VoLTE call drops due to coverage issues should largely become a thing of the past. For now, though, simply because a carrier touts that it has VoLTE, don't expect perfect service. Offering VoLTE and consistently delivering on the promises it offers remain two different propositions. Initial results from the broader IHS Markit report suggest that despite the potential difficulties, AT&T and T-Mobile are making the transition from circuit-switched to VoLTE with minimal interruption. As VoLTE becomes the norm, carriers will be able to re-farm the spectrum they must currently keep locked open for circuit-switched calling. Fully transitioning to VoLTE will simplify network structure and let carriers find new uses for the spectrum they already have. Building on VoLTE, carriers will be able to expand their QoS offerings to include Rich Communication Suite features such as enhanced file sharing, video calling, and instant messaging-all prioritized for guaranteed delivery to make real-time applications smooth and reliable. Initial IHS RootMetrics testing shows that VoLTE is delivering on its promise of better audio quality. Mean Opinion Score (MOS) remains the industry standard for measuring audio quality. MOS takes into consideration factors such as packet loss, jitter, and latency, all of which can impact voice quality. MOS is traditionally calculated on a scale from 1 to 5 (1 = worst and 5 = best). Results from testing in the Seattle area during February 2015 showed the VoLTE networks for AT&T and T-Mobile delivering MOS results approaching 3.5. Consumers would likely find audio quality in that range superior to what they typcially experience on non-HD Voice, non-VoLTE networks. As a further point of reference, the IHS Markit report notes that MOS scores for non-HD Voice topped at 2.5 during a similar study in Chicago in 2014. For further insights into the current state of VoLTE performance in the US and UK, including analysis of frequency bands used, call setup times, and the potential for global expansion, download the full IHS Markit report.